How does labelling products and putting up signs in stores affect consumer choices, especially if you are trying to encourage consumers to buy sustainable seafood? When researchers tested how ecolabels for sustainably harvested seafood would affect shopping choices in Germany and Norway, they found that customers bought significantly more seafood overall – including options that were not sustainably harvested. The label for sustainably harvested seafood is a small blue and white fish logo on the packaging of fish products you buy in the store. This is the ecolabel of the Marine Stewardship Council (MSC), which denotes wild-caught fish and seafood and a promise that the product was harvested using sustainable fishing practices. The ecolabel is used all over the world, with the World Wildlife Fund (WWF) among the first to establish its use in order to reverse the decline in important fish stocks. However, it turns out that product labelling alone is not enough to change our shopping habits. Surveys show that price and taste matter most to people when they buy seafood – and research also shows that we largely allow social norms to govern our choices when we shop. In other words, we tend to buy the same products as our friends and family members. Researchers at the Norwegian University of Science and Technology (NTNU) therefore decided to test what would happen if store customers were told that lots of other shoppers bought MSC-labelled seafood. They thought customers would go with the flow and act like "everyone else" – but the results did not quite turn out the way the researchers imagined. Isabel Richter's doctorate in environmental psychology at NTNU explored how people can be motivated to eat more sustainable seafood. She was granted permission to carry out an experiment in various grocery stores in Norway and Germany. She had conducted two studies before then, both of which confirmed that social norms are the most stable factor in motivating people to buy sustainable seafood. 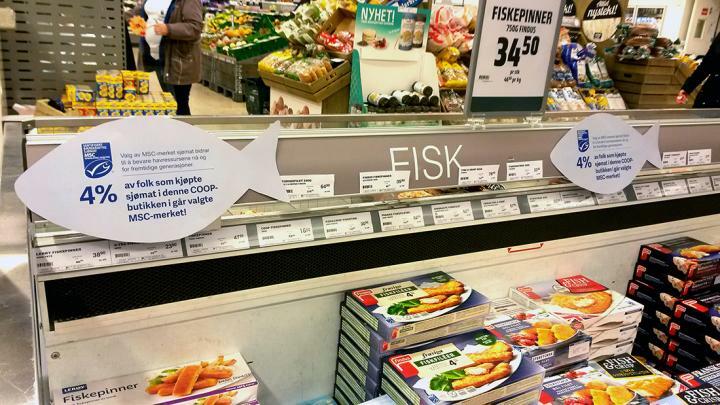 The signs had almost no effect on the sale of sustainable salmon and cod. Instead, the researchers discovered that the total sales of seafood products, both with and without ecolabelling, skyrocketed. Richter started by first putting up a sign with information about the MSC label on the seafood cooler. In the next trials, she put up eight different signs with an image and label information – plus some wording telling shoppers that a percentage of the customers who shopped at that particular store chose to buy seafood with the MSC label. Four of the signs said that more than 50 per cent of the customers in the store selected eco-labelled products, while the other four signs said that less than 50 per cent of customers did this. The cooler included salmon and cod both with and without the MSC label, with similar prices and weight. In the Norwegian stores, about 70 per cent of the products were not labelled. In Germany, the MSC ecolabel is more widespread so several products included it. Richter and her colleagues assumed that more customers would choose MSC-labelled products in the stores where they were told that more than half of the other customers bought MSC-labelled seafood. That wasn't how it went. The signs had almost no effect on the sale of sustainable salmon and cod. Instead, the researchers discovered that the total sales of seafood products, both with and without ecolabelling, skyrocketed as long as the signs were on display at the coolers. In the Norwegian stores, total seafood sales increased by 70 per cent during the test period, while the increase in German stores was 30 per cent. "We wanted to motivate people to eat more sustainable seafood, but instead we motivated them to eat more of all kinds of seafood – including non-sustainable options. Ecolabelling is a very common form of sustainability communication, so it was important for us to find out what had really happened here," says Richter. Since the researchers only had sales figures from the store trials and hadn't interviewed customers, they decided to conduct a new laboratory study. Richter created a virtual store, where participants in the study could freely choose different groceries from the shelves. They were given 20 Euros each to shop with. The items had no familiar brand names, but they had labels that communicated different messages, including that products were sustainable. Some had labels with nothing on them. "Maybe the labels would have worked better if there'd been just one label for all the sustainable products." Before the virtual shopping tour, participants were presented with a variety of messages – such as a picture of a fish and text stating whether the fish was healthy or unhealthy – without knowing that this was part of the experiment. The researchers presumed that people would buy more of the products marked with a message, regardless of whether the message was positive or negative, if they had seen the product before. "Even if you tell consumers that milk prevents osteoporosis, 'milk' is the only thing they remember," said Richter. "If customers are encouraged to buy organic cucumbers, it's just 'cucumbers' they want. If we recommend that people eat less of something and at the same time we mention the entire product category, people are motivated to eat more of everything in that product category." So does using ecolabels on products make any sense? "We think what might work is to communicate what customers should do, and not what they shouldn't do," says Richter. For example, if we ask people not to choose endangered tuna the next time they buy sushi, they'll just want to have tuna. Instead, we should recommend that they choose sustainable scallops for their sushi. "Maybe the labels would have worked better if there'd been just one label for all sustainable products. So many different labels are out there now." "And even without the ecolabel, fish already has so many other labels: the Nordic keyhole label, that it's antibiotic-free, locally produced, and so on. People don't know what all the different labels mean," Richter says.